Authentic combat film of World War I is so rare that at least one eminent World War I historian dismissed the notion filmed scenes might be real. "It's all fake. Nobody filmed a single battle," as Jay Winter, emeritous professor of history at Yale University, was quoted in Tony Dokoupil's February 18, 2008, Newsweek article "The War We Forgot". 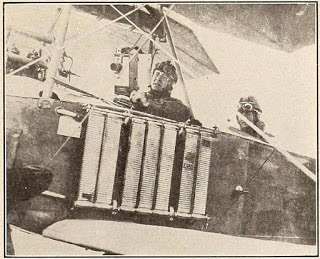 True enough, while researching our book American Cinematographers in the Great War we came across some examples of film scenes that were staged. The reasons for re-enacting these scenes are complex. Sometimes a shot was reconstructed because the cameraman wasn’t on the spot in time to set up and capture the event. Sometimes a scene was staged that had never even happened because it would make for a sensational movie. However, not all World War I shots were faked and in some instances a camera operator was able to record a stunning scene of actual fighting. Intrigued by this scene, co-author Jim Castellan asked nitrate vault manager George Willeman at the Library of Congress for a breakdown of these shots, which resulted in 51 sequential frames that were analyzed in close detail. There were some interesting conclusions. First, the supposed casualty was not firing when he got shot by the Russian sniper, but appears to be reloading or unjamming his rifle while taking cover behind the wall. Then something strange happens: the German soldier suddenly begins to keel over his left side at the same time as his right arm leaves his rifle and travels quickly toward his neck. Jim Castellan next discovered a crucial detail in frames 573-576. “I saw a bulge quickly form just below the soldier’s right ear and jaw area, increase in 574, appear the same size in 575 and then disappear in about a fifth of a second. 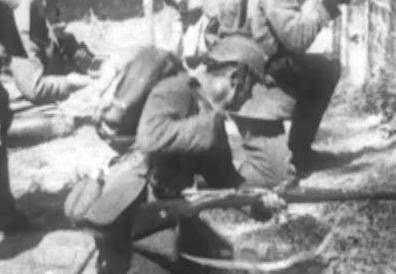 Although not for the German soldier, the Bloni casualty captured on film was a million dollar lucky shot. Firstly the film didn’t have a dramatic bullet exit which the censors wouldn’t have permitted Durborough to keep. Secondly, the bullet hit just enough bone and tissue along its path and stopped just short of exiting a fleshy area that caught the rapid ballistic expansion and collapse of the flesh on film”. In short, the most logical explanation for this briefest of tissue bulge is the film captured an original gun shot wound to the head - an authentic World War I combat scene. The sudden bulge appearing on this unfortunate German soldier's face was likely from a Russian sniper, as explained in the intertitle of Durborough's film. A bullet's impact on human flesh is demonstrated in this BBC video, using ballistic gel that simulates a similar rapid expansion and rebound of soft human tissue as the bullet passes through. As a further illustration we have compiled a selection of slow motion shots and close ups from this combat scene in Durborough's film, which can be seen here on our YouTube channel with comments by authors Cooper Graham and Jim Castellan. We recently prepared a new, extended story on Durborough's photographic work during World War I. You can read this Durborough Film Annotation (2nd edition) here. I guess the bulge on his neck could be something else, but that seems like it would be a unrealistic coincidence. Thank you for this! We had noticed the cartridge in these images. Given the position of this soldier, to the left of the casualty, as well as the distance, the empty cartridge that was released from his rifle cannot have been the cause of this head shot. Note the casualty right neck is never exposed to the rifleman standing a little behind and to his left. Given the shell case ejected somewhat forward toward the wall it couldn't possibly hit the right side of the neck of the casualty.